PanARMENIAN.Net - Two weeks after Cher unleashed her take on “Gimme! Gimme! Gimme!,” the pop diva dropped yet another ABBA cover on Thursday, Aug. 23, Billboard reports. For this round, the legendary Swedish group’s 1975 smash “SOS” gets a glossy Cher revision. With a club-ready thump and a glitter-dusted synth line not unlike the one on her "Gimme!" cover, the “Believe” singer - who has Armenian roots - adds her trademark Auto-Tune flourishes to the mix -- taking the mid-tempo classic for a brisk dance break. 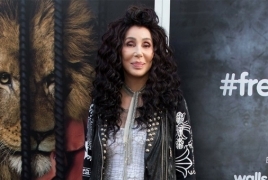 Cher’s suite of ABBA covers is set for a Sept. 28 release via Warner Bros.